Eyes left! What are these Royal Enfield C5s doing in a parade ground line-up? A sharp looking row of Royal Enfield C5 Bullets caught my eye in an ad on CraigsList in Richardson, Texas. The ad asked $5,500 for a 2011 C5 but the picture told me there must be more to the story. 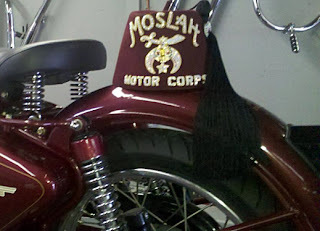 "I’m a member of the Moslah Shrine Motor Corps of Fort Worth, Texas; the guys in the funny hats; the Shriners," seller Dan Hill replied to my inquiry. "In addition to raising awareness for our 23 non-profit children’s hospitals around the country as you may have heard we also like to have fun. We have 13 Shrine temples in Texas and each year we get together the first weekend in June and compete against each other. "My unit was founded in 1959 and we compete in motorcycle precision drill and agility competitions against other Shriners. The unit originally rode 1958 Cushman Eagle scooters, but for the last 30 years the team has been riding 1981 Kawasaki KZ440s. The unit bought 24 matched bikes in 1981 and after 30 years many still have less than 5,000 miles. 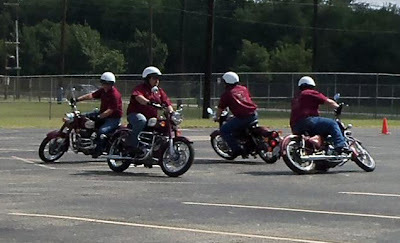 Shriners perform precision drill on Royal Enfield C5s. 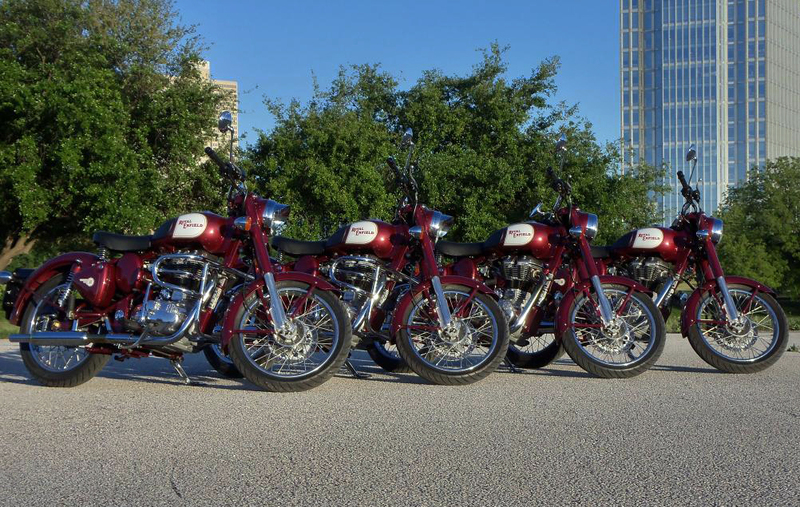 "We decided to try out a new bike last year and bought four 2011 Royal Enfield C5 Classics in Royal Maroon. We chose the Royal Enfield because it fit the displacement requirements of our competition class. We liked the fuel injection, the rear drum brake, and they are simply gorgeous bikes. We chose the color Royal Maroon because it so closely matched our traditional headgear (see photo). Red C5s match Moslah Motor Corps colors. "The bikes are beautiful and got a lot of attention, but we found the lack of folding foot pegs, the curve and positioning of the rear brake pedal, and the low exhaust clearance to be a hindrance in our precision drill maneuvers. In order to run our usual drills we had to run slower speeds due to the lean angle limitations, and make our tightest turns counter clockwise due to the ground limiting our pedal travel while trail braking. "While the Royal Enfields were a big hit in parades and straight visual appeal they unfortunately didn't suit our needs." If you've seen the Shriners perform in parades you know they do their maneuvers in seemingly impossibly small spaces, sometimes within inches of crowds overflowing from the sidewalks. Obviously, this is a game of inches. You probably don't need quite this level of maneuverability. Group found that counter clockwise turns allowed more lean. Want to buy one of the Shriner's Royal Enfields? Dan advises that "in the original picture my bike is the second from the left. The bikes are individually owned and we have two left; the other is the bike on the far right." Second from left and far right are still available. unit's "colors" if ordered at the same time. Thanks David, it looks great. I agree that there was a missed opportunity. Back in the late 50's Cushman made a Shriner specific model, Harley Davidson has been making Shriner specific motorcycles for several years and many Shrine temples use them. We purchased our unit bikes from Royal Enfield of Fort Worth and I know they had additional bike sales as a direct result of our purchasing from them and possibly others indirectly due to seeing our bikes around town, in our Circus, and online posts.